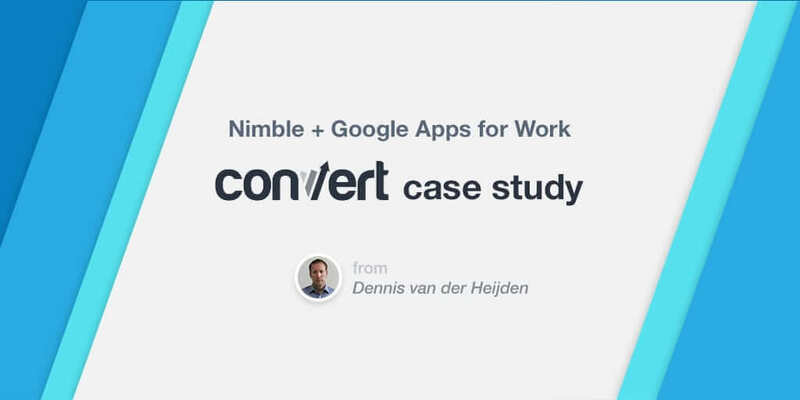 I recently sat down with Convert’s CEO Dennis van der Heijden to learn about how the new Nimble integrations with Google Apps for Work are helping him run his company, and could work for yours. Could you tell me a little bit about Convert? 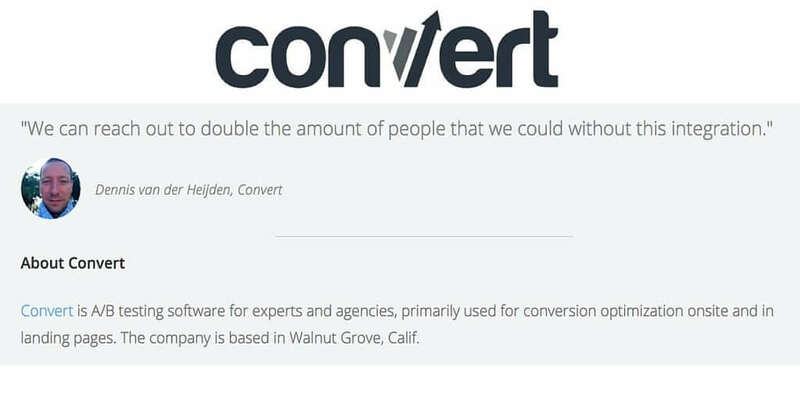 Convert offers affordable A/B testing software for companies to optimize their websites and e-commerce conversions. They are an agile team spread across the globe and they rely on Nimble + Google Apps for Work to facilitate their collaboration. When did you start using Google Apps and Nimble at Convert and why? Before Nimble, we didn’t have a comprehensive view of our clients that interacted with us across several channels — email, chat, social media, and phone. With Nimble, we’re able to link all of our interactions, meetings, and documents, so everything is now centrally available in Nimble with connectors and login through Google Apps. How does combining Google Apps and Nimble help your team? Since Convert is a small and agile team, we are always collaborating on shared documents and client communication to allow every team member to give their input. In Nimble we search and filter the customer segments that we communicate with and do a quick export. By using Nimble tags and Google Spreadsheets, we build spiders and use manual labour to enrich spreadsheets and rank leads. This allows us to use the best of both worlds. How do you continue to share information as Convert scales? Our team uses Google Apps for Work products like Gmail, Google Drive, Google Hangouts, Google Docs and Spreadsheets for our daily productivity suite. We connect these solutions to Zapier, Slack, and Asana to keep everything updated and synchronized. All these tools that interlink allow us to quickly work together on documents. As a distributed team, open communication is important. How do you maintain it? We use Gmail, Google Drive, Google Hangouts, Google Docs and Spreadsheets for collaboration and Nimble is where we tie together our company contacts, communications, and calendars. What would you recommend for other companies of your size? We recommend combining Nimble + Google Apps for Work for a seamless workflow. By combining the two, you’ll rest easy by knowing all your important contact notes & information are up to date, secure and not buried in the abyss of team members’ personal computers. We can finally rest easy by knowing that all our data is unified and in sync between Nimble and google Apps. If you’re ready to enjoy the benefits that automation and web apps can do for your peace of mind and productivity, Nimble and Google Apps for Work is a smart move to have all your data updated simultaneously. As part of our partnership with Google, we are offering 20% off Google Apps for Work for the first year of any new account that sign up via our special registration link at www.nimble.com/google-apps. Follow the steps on this page to receive a promotion code from our Nimble Customer Care team.